The trial also heard today from a paediatrician who said a baby of Joshua’s age could not have formed or swallowed the wad of tissue that a pathologist found in the baby’s throat and the prosecution alleges caused his death. The paediatrician also told the jury she did not believe it would be possible for the wad to become lodged as it did by efforts to remove it. 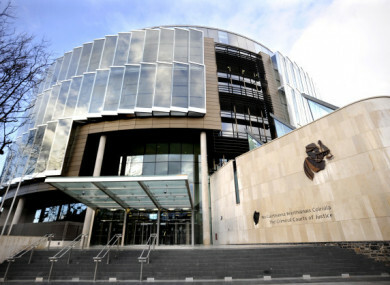 John Tighe (40) of Lavallyroe, Ballyhaunis, Co Mayo denies murdering Joshua Sussbier Tighe at his home on 1 June, 2013. He has pleaded not guilty and is on trial at the Central Criminal Court. This morning Sergeant Alan Ryan told prosecuting counsel Paul Murray SC that he arrived at Tighe’s home shortly after Joshua had been declared dead. Tighe was “crying uncontrollably” and told Sgt Ryan that he had changed the baby’s nappy, went to the toilet and when he returned the baby had difficulty breathing. What happened? What have you done? Tighe repeated what he had said to Sergeant Ryan, telling her the child must have swallowed something. Ryan recalled that Natasha noticed blood in various places – the court has heard there was blood on the baby’s clothes, Tighe’s pyjamas and on the floor. When Sussbier asked about the blood, Tighe told her that while he was attempting to bring up the obstruction he put his finger in the baby’s mouth and this caused Joshua to bring up blood. Under cross examination SRyan told Desmond Dockery SC for the accused that he also remembered that before Natasha arrived Tighe told him: “She is going to kill me,” referring to Ms Sussbier. The following day Ryan took a voluntary statement from Tighe. He agreed with counsel for the defence that Tighe was “extremely forthcoming” and gave a lengthy and detailed statement. In the statement Tighe detailed his relationship with Sussbier, that they met in 2011 and had a connection. He sent her “about 1,500 texts a week,” and she moved in with him in Lavallyroe in September that year. By February 2012 she was pregnant and they spent time doing the house up in preparation. “We were very happy,” he said. They were delighted when Joshua was born but the relationship between Sussbier and the accused deteriorated before she moved out and they agreed to share custody of the baby. Ryan said that Tighe was distressed, traumatised and required several breaks while making the statement. Recalling events of the previous day, Tighe told Ryan that when he was changing Joshua’s nappy there were tissues and wipes loose by the baby’s head. Tighe went to the toilet and when he came back the child was “a bit glazed looking” and had gone quiet. His breathing was becoming difficult and he went blue. He put his finger into the baby’s mouth and could feel the tissue. He thought that if he could moisten it, it might come up so he put the child under a tap in the kitchen. He tried phoning two doctors before getting through to the HSE’s emergency WestDoc service. They told him to hit the baby on the back and front and to try to grab the tissue but he couldn’t and Joshua died by the time a doctor arrived. Murray read a report made by former Deputy State Pathologist Dr Khalid Jaber who carried out Joshua’s post mortem. Dr Jaber said he took a wad of tissue from Joshua’s throat which weighed 19 grams and was 5.5cm long, 3.5cm wide and had a breadth of 2.5cm. He also detailed an injury to the baby’s frenulum, a piece of connective tissue in the mouth. Dr Hilary Stokes, a paediatrician based in Mayo, told Murray that babies aged six months can “crudely” grasp objects with all four fingers but can’t perform tasks requiring manual dexterity such as picking up small objects. She said a baby would crudely grab hold of a tissue or baby wipe and would have tried to get it into his mouth and if it tasted nice he would probably try to swallow it. She said it would not be possible for a baby of that age to compress the tissue into the wad that Dr Jaber found in the baby’s throat. She added that it would not be possible for the child to chew the tissue to form the wad. Babies at six months are limited in their ability to chew in an up and down motion, an ability they develop after about nine months. That is the reason, she said, that we don’t give solid food to small babies. When Murray asked her about the ability of the baby to swallow the wad, she said that a baby that age is not designed to swallow something like that. It is not in any of us to do that. She said it would be unpleasant and the child would have brought it back up immediately. Dr Stokes also did not believe it would be possible for the wad to become lodged as it did by Tighe’s efforts to remove it with his finger. She said that the wad is large relative to the oral cavity and if it were to become lodged, it would have become lodged higher up. She further stated that she didn’t believe it would be possible for the infant to insert the tissue in such a way as to render it impossible for an adult to remove it. Dr Stokes will be cross examined by counsel for the defence tomorrow in front of Justice Patrick McCarthy and a jury of nine women and three men. Email “'What have you done?' Mother said to father accused of murdering their six-month-old child”. Feedback on “'What have you done?' Mother said to father accused of murdering their six-month-old child”.